Piece of art? Clearly needs to be a cookie. Skeleton stuffed doll? COOKIE! Literally everything on Pinterest? You mean literally everything I want to cookie. Yes, I just used cookie as a verb… That’s just the way we roll around here. 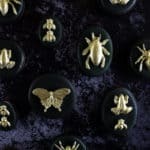 So I’m sure you can imagine my excitement when I saw these gilded insect plaques from the Gathered House on Pinterest last year. Seriously guys, they even ALREADY look like cookies. HOW DO YOU PASS THAT UP? If there was anything that wasn’t a cookie but wanted to be a cookie, it would be these guys. 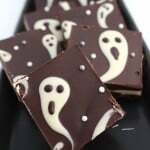 And they’ve got that spooky glam thing going for them, which I’m realizing my Halloween baking list is all about this year. I hope you like Halloween glam because we’re going to do us some Halloween glam something serious. Now, I’m sure some of you are thinking “Whoa girl! It’s not even October yet!” I know. I KNOW. I have showed so much restraint, you don’t even know! I mean, I see an uptick in blog traffic to Halloween posts in July so by that logic I’m already 2 months behind the 8 ball. 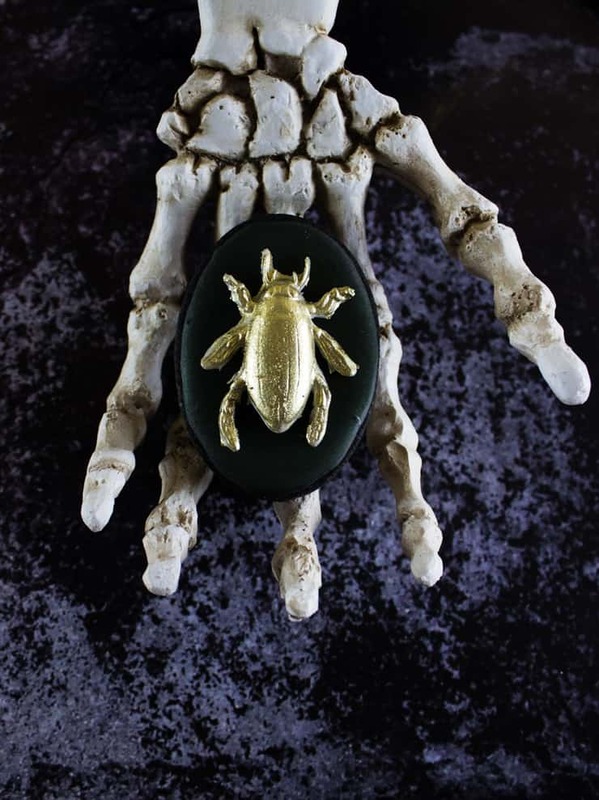 Also, did I mention I saw these gilded insect plaques a year ago? That’s a whole year of Halloween-related restraint! And you’re talking to a gal who keeps a 3 inch binder of Halloween ideas… just for decorations. I repeat: RESTRAINT. But I couldn’t do it any longer. These golden little guys were just TOO spooky sweet to keep to myself any longer. WELCOME TO OUR FIRST HALLOWEEN POST OF THE YEAR! 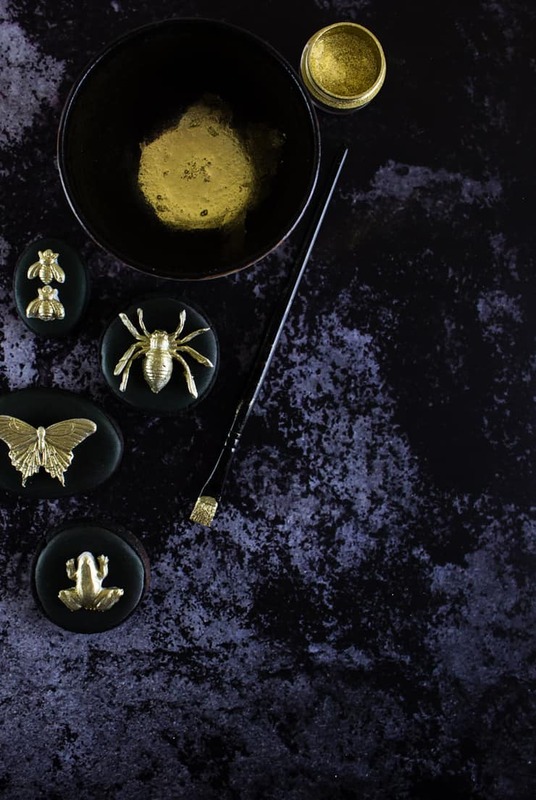 These gilded insect cookies are equal parts creepy and gothic chic. 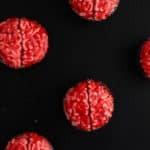 Delight all the boys and ghouls at your next Halloween party with these deliciously creepy cookies. Start with 2 dozen cookies in various sizes of circles and ovals. Make sure whatever size you use will fit the finished bugs. Mix up a batch of white royal icing and ice your cookies. I like to use a 20 second icing consistency to ice my cookies. For more on icing cookies with royal icing, check out this post. Let dry overnight. While your cookies dry, you can make your bugs. Knead together your white fondant and a little bit of yellow food coloring until the fondant is a light, golden yellow. Knead in your tylose powder (you can skip this step if you don’t have tylose powder, but it will help the fondant stiffen completely). Roll a small piece of fondant out to 1/4″ thick. Make sure it’s a little longer and wider than the impression in your mold. Press your fondant into your mold and cut off any excess using a sharp knife coated in powder sugar (to keep the fondant from sticking). Use a variety of bug shaped molds (I bought mine from Steel Penny Cakes and Molds) to make your cookie toppers. Mix a small amount of powdered gold food coloring (Truly Mad Plastics’ gold food coloring is my absolute favorite) with vodka. 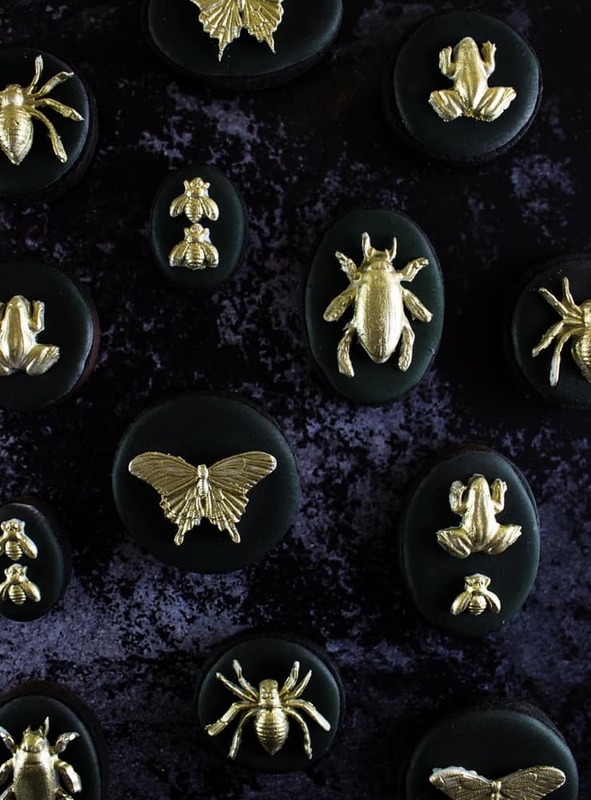 Using a food-only brush, paint your fondant insects with your gold food coloring. Allow to dry until dry to the touch (a couple of hours). 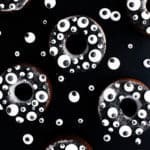 Once the royal icing on your cookies has dried complete, use an airbrush machine with black airbrush food coloring to make your cookies completely black. Alternatively you can use black food gel coloring with a little vodka and a food-only brush to paint the cookies black. Allow to dry completely (a couple of hours). 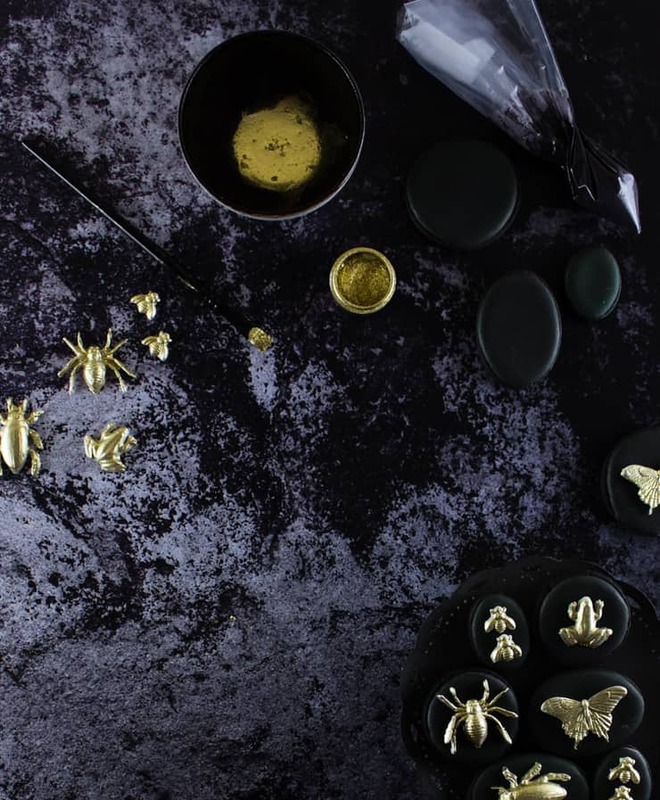 Melt a small handful of black candy melts and use it to “glue” your golden bugs to your cookies. Allow to harden before packaging. These cookies look amazing. 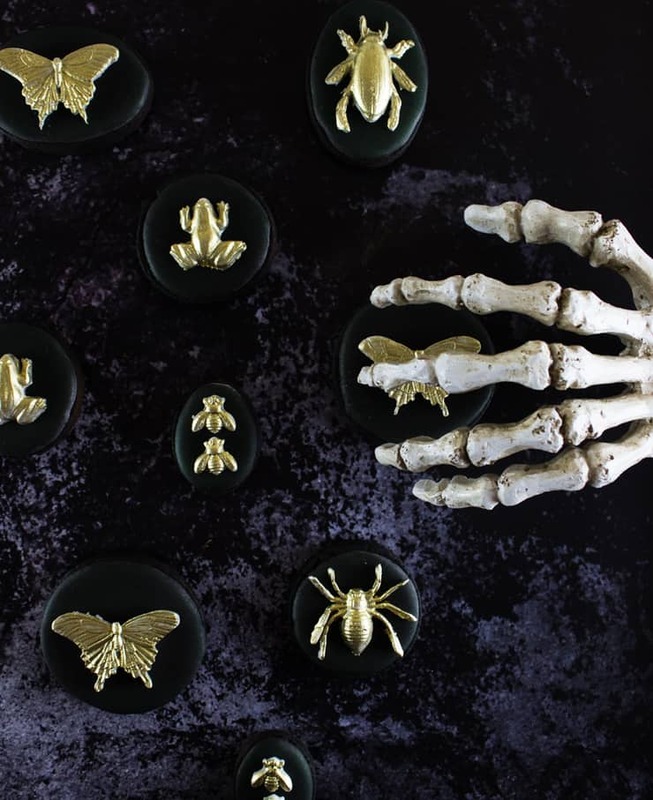 Those little insect molds were a definite score, but I can’t believe how beautiful, and creepy, they look. I can’t wait to see your other Halloween posts. I love the gold! What an excellent idea for a sophisticated treat for an adult party! I haven’t done a lot of work with fondant but I am for sure going to have to play around with it because I love this idea. Can’t wait to read through all your cookie creations! 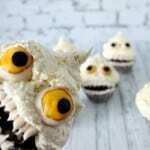 Those cookies are perfect for the little people who love ghoulish things. I stare at them and I’m fascinated and appalled at the same time. The cookies will be a tremendous hit at Halloween. This idea is BRILLIANT! So perfect for Halloween. I absolutely love it and hope to make these! OMG these are soooooo gorgeous! They are almost too pretty to eat. I loved decorating cookies when my son was little and you’ve inspired me to get out me merengue powder and piping bags! This is so creative and very well done! It looks very elegant, too, which is kinda odd to say seeing that we’re talking about insect cookies. Lol! Really neat idea! These little guys are so cute!! I’ll happily join you in the judgement free zone and admire your handiwork! These cookies are amazing! I’d totally wear these. They remind me of the Balenciaga bug jewelry that I’ve been seeing everywhere. These are INSANELY beautiful! Well done!